Hannah Lowe has won the 2015 Michael Murphy Memorial Prize for her 2013 debut collection Chick, it was announced on National Poetry Day, Thursday 8 October. The biennial award, worth £1000, will be presented to Hannah at a ceremony later in the autumn. Half of the shortlist was made up of titles published by Bloodaxe. The other three Bloodaxe titles were: Niall Campbell’s Moontide (2014), Vidyan Ravinthiran’s Grun-tu-molani (2014), and another 2013 title, Heather Phillipson’s Instant-flex 718. 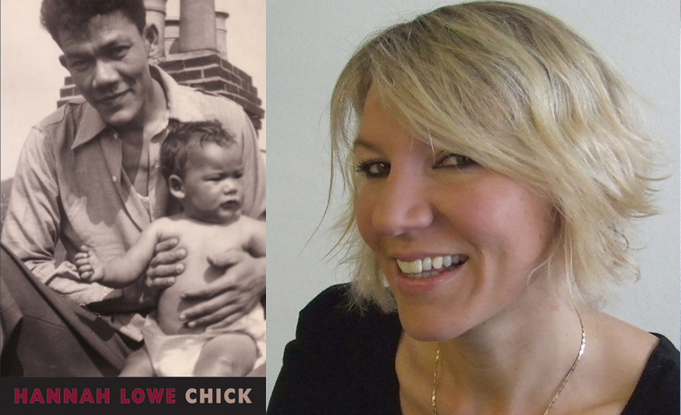 Hannah Lowe’s debut Chick focused on her father, a Chinese-Jamaican gambler, who was known as both Chick and Chan. Hannah explores his life further in her forthcoming second collection Chan (due from Bloodaxe in June 2016), which also features Jamaican saxophonist Joe Harriott and other figures from 1960s London. Hannah’s prose memoir about her father, Long Time No See, was BBC Radio 4’s Book of the Week from 27 to 31 July this year. Chick was also shortlisted for the Forward Prize for Best First Collection, the Fenton Aldeburgh First Collection Prize and the Seamus Heaney Centre Prize for Poetry 2014.